Price change condition allows to set min/max limit for price changes over specified period of time. Can be used to determine ‘drifters’ and ‘steamers’. Drifters are selections whose price is lengthening. Steamers are selections whose price is shortening. The settings are located on Betting conditions page. 1. 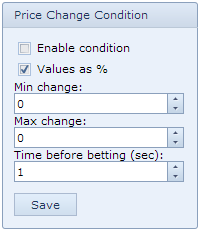 Enable condition – tick to turn on the betting condition. If not enabled, this condition will not be checked. 2. Values as % – tick if price range should be set in % rather than in absolute amounts. 3. Min change – min limit for the price change. Can be positive or negative (-). 4. Max change – max limit for the price change. Can be positive or negative (-). 5. Time before betting (sec) – sets a time period (in seconds) that is used to measure the price change. The time is set as number of seconds before betting. For example if you set time to fire bets as 60 seconds before the off and this time as 180 seconds, the price change will be measured from 240 to 60 seconds before the off. For all examples lets assume that ‘Enable condition’ is ticked, ‘Time before betting’ is 120 and bets are set to fire at 60 seconds before the off. The runner’s price 180 (60 + 120) seconds before the off is 3.50. At 60 seconds before the off it’s price has shortened to 2.75. Price change = (2.75 – 3.50) / 3.50 = -0.214. The price has shortened by 21.4% which is less than required 50%, therefore the bet must be cancelled. The runner’s price 180 seconds before the off is 3.50. At 60 seconds before the off it’s price has lengthened to 5.0. Price change = (5.0 – 3.50) / 3.50 = 0.428. The price has lengthened by 42.8% which is less than our max limit 50%, therefore the condition is matched and the bet should be placed. The runner’s price 180 seconds before the off is 3.50. At 60 seconds before the off it’s price has lengthened to 8.5. Price change = 8.5 – 3.50 = 5.0. The price has lengthened by 5 points which is more than required min 3 points, therefore the condition is matched and the bet should be placed.